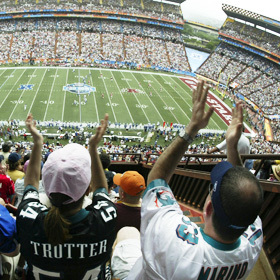 SIDELINES: The start of yesterday's NFL Pro Bowl at Aloha Stadium had a sold-out crowd watch the NFL's best duke it out. Bob Repin, left, of Chicago, and Louann Grohnan and Charles Evans of Mays Landing, N.J., showed their support at kickoff by donning their favorite players' jerseys. The NFC gives the effort required to win the Pro Bowl for the second time in six years. Expected projects to fix underground pipes will hamper business revenues. Kids get their hands dirty learning to treat the environment with care. One play, one Most Valuable Player award. Cale Wofford is no Captain Ahab, but he is a captain and he does hunt for whales. Bills to transfer tax collections to the city or a private company remain in play in the first go-rounds at the state Legislature.